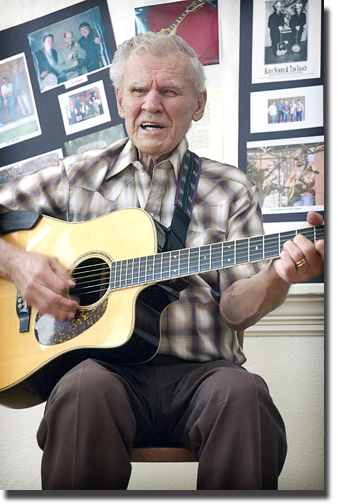 Doc Watson is a self-professed 'musician of the people' who tries to stay away from pedestals, yet I can't help but place him up there in my mind. Any day I get to listen to him sing is a treat. Today I listened to him play to the press for an upcoming performance at the Music Fest in Sugar Grove this weekend. Next on my day's agenda: Sit with dragonflies. P.S. This is the 10th annual MusicFest and I'd like to note that all the bands are from North Carolina. O.k., so the Kruger Brothers are originally Swiss, but they like North Carolina mountains the best. P.S.S. Oh how in the world am I gonna cover both the MusicFest and the Grandfather Mountain Highland Games? Hope the parking press pass gods are smiling upon me;) Really--this is work. P.S.S.S. Welcome all of y'all from the Delphi Forum. Yep, Doc is 84 years old, but I assure you from what I heard yesterday, the man has his mind and music all together. He is a wonder!